Britney Spears' father testified for nearly 90 minutes Monday about why he felt a long-term restraining order should be issued against three people, including the singer's former manager and an ex-boyfriend. 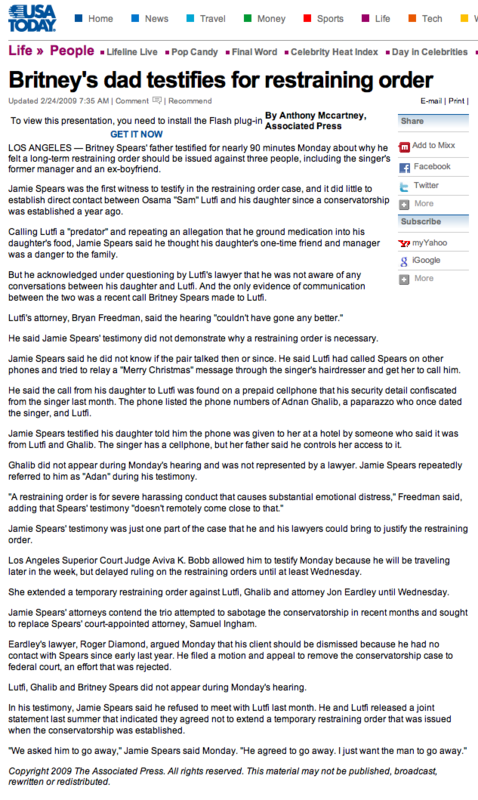 Jamie Spears was the first witness to testify in the restraining order case, and it did little to establish direct contact between Osama "Sam" Lutfi and his daughter since a conservatorship was established a year ago. Calling Lutfi a "predator" and repeating an allegation that he ground medication into his daughter's food, Jamie Spears said he thought his daughter's one-time friend and manager was a danger to the family. But he acknowledged under questioning by Lutfi's lawyer that he was not aware of any conversations between his daughter and Lutfi. And the only evidence of communication between the two was a recent call Britney Spears made to Lutfi. Lutfi's attorney, Bryan Freedman, said the hearing "couldn't have gone any better." He said Jamie Spears' testimony did not demonstrate why a restraining order is necessary. Jamie Spears said he did not know if the pair talked then or since. He said Lutfi had called Spears on other phones and tried to relay a "Merry Christmas" message through the singer's hairdresser and get her to call him. He said the call from his daughter to Lutfi was found on a prepaid cell phone that his security detail confiscated from the singer last month. The phone listed the phone numbers of Adnan Ghalib, a paparazzo who once dated the singer, and Lutfi. Jamie Spears testified his daughter told him the phone was given to her at a hotel by someone who said it was from Lutfi and Ghalib. The singer has a cell phone, but her father said he controls her access to it. Ghalib did not appear during Monday's hearing and was not represented by a lawyer. Jamie Spears repeatedly referred to him as "Adan" during his testimony. "A restraining order is for severe harassing conduct that causes substantial emotional distress," Freedman said, adding that Spears' testimony "doesn't remotely come close to that." Jamie Spears' testimony was just one part of the case that he and his lawyers could bring to justify the restraining order. Los Angeles Superior Court Judge Aviva K. Bobb allowed him to testify Monday because he will be traveling later in the week, but delayed ruling on the restraining orders until at least Wednesday. She extended a temporary restraining order against Lutfi, Ghalib and attorney Jon Eardley until Wednesday. Jamie Spears' attorneys contend the trio attempted to sabotage the conservatorship in recent months and sought to replace Spears' court-appointed attorney, Samuel Ingham. Eardley's lawyer, Roger Diamond, argued Monday that his client should be dismissed because he had no contact with Spears since early last year. He filed a motion and appeal to remove the conservatorship case to federal court, an effort that was rejected. Lutfi, Ghalib and Britney Spears did not appear during Monday's hearing. In his testimony, Jamie Spears said he refused to meet with Lutfi last month. He and Lutfi released a joint statement last summer that indicated they agreed not to extend a temporary restraining order that was issued when the conservatorship was established. "We asked him to go away," Jamie Spears said Monday. "He agreed to go away. I just want the man to go away."